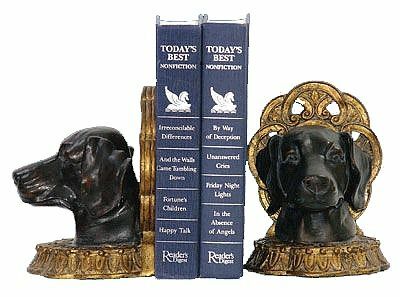 If you are seeking Black Lab dog gifts that strike a chord for the Labrador lover, then this set of Black Lab bookends might be of interest. Created with an antique classical finish. Resin. Dimensions: 10"H x 5.3" x 7"
While a Labrador is known to have a high pain threshold as compared to other breed dogs, it is said that it sometimes does not know how to express itself when it gets into trouble. As such, dog owners have to continually monitor their dogs to ensure they do not have any wounds which need care. Because of this though, Labradors are used as search and rescue dogs as well as service dogs around the country.